An interesting inscription on a lintel discovered under the pavement of the forecourt of the Temple. The inscription by a King of the 17th Dynasty pre-dates the Ptolemaic construction by at least 1300 years. The Temple text tells us that the Temple was initiated in the year 237BC by Ptolemy III to be completed in 57BC, 180 years later by his successors. The lintel in question was fashioned in 1628/1627BC by an ephemeral Pharoah named Dhuti. 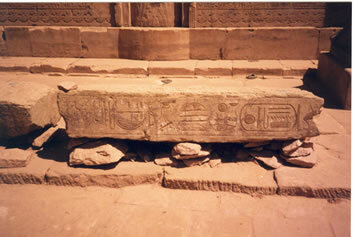 When discovered the lintel was upside down, as shown in the above photograph, taken by me in 1987. "The Horus of Gold. User Kha U"
"The King of Upper and Lower Egypt"
"Lord of the Two Lands"
"The King reigned for only one year in turbulent times"